Neck area is among the initial areas where aging is felt initially. Also, we can observe neck sagging on young persons due to genetic reasons or due gain/ loss of weight. Some of the main issues of neck extensions operations are loose, dimmed balloon images, excess fat textures, gravelled muscle structures, turkey neck deformities and distinctive double chin structure. It will be wrong to distinguish the neck aesthetic from the facial aesthetic.Neck is a continuation of the face and the rejuvenation work should be done as a whole.If these problems in the neck region are also present in the face, the combined operation will result in more striking and effective results. 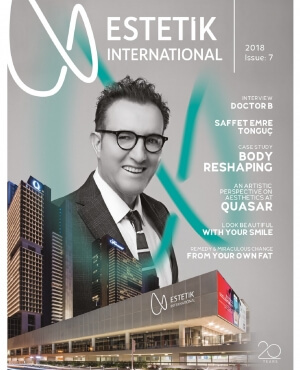 As Estetik International Health Group, we make different applications by classifying the probable neck aesthetic problems according to the degree of deformities. When neck extension operations are considered in the surgical procedure, we recommend that the neck region be expressed as a continuum and an integral part of the face and that this operation should be performed together with face lift operations. The neck extension operation which begins under local or general anesthesia, the incision is made from the front of the ears towards the back of the ear and towards the hair region and to the natural jaw line. The sagging and deformed muscle structure is tightened, excess fat tissue and excess skin are cut off in accordance with the existing structure. The reshaped neck is closed again by sewing it back to its incision. After neck extension surgery, there may be little edema and bruising. Depending on the condition of our patient, an overnight sleep may be suggested or the patient may return to home after the operation. Who Can Get Neck Extension Surgery? Spider Web Aesthetic surgery is an alternative technique for stretching the skin. Spider Web Aesthetics, for which we receive extremely good and effective feedbacks for neck aesthetics, provide our patients the comfort of neck extension without surgery.The number of ropes determined according to the degree of deformation in the neck of the patient, is placed through the fine-tipped needles in the lower skin.The body reacts to ropes and accelerates the formation of elastin and fibroplast by increasing collagen production in the region.At this point, neck region is stretched and the existing deformation begins to have shape over time.After the Spider Web Aesthetics, you can immediately engage in your social life and continue where you left off without the need for any dressing or wrapping. Neck extension is a process that rejuvenates the region and gives form to the neck region suffering from the sag and loss of the jaw line. Who can have Neck Extension? The best candidates for neck extension are those who are uncomfortable because the neck and / or jaw line with undesirable form.Most patients complain of an old appearance caused by excessive looseness below the undesirable plethora under the jaw.These changes are usually the result of three different components (loose skin, muscle sagging (called platismal banding), and a combination of excess fat.Loose skin is a result of the aging process.Muscle slacking occurs in the same way, in conjunction with the aging process, by pressure on a thin large muscle layer (platyma) extending to the length of these muscles.Both sides normally have a platysma muscle, and as the aging process progresses, the sides of the muscle on both sides begin to sway downward and two visible bands appear from just below the jaw to the collarbone.This is commonly referred to as the "turkey neck" deformity (combined sagging skin and muscle).Also, patients with excess fat have an undesirable jaw line under the jaw, which is called as double chin.All three components can coexist in the same patient and cause premature aging to occur. Anyone who experiences these three problems can benefit from the neck extension procedure. What type of anesthesia is used for neck extension? Mostly, neck extension is done under deep sedation or general anesthesia. How is neck extension made? Neck extension starts with incisions hidden behind the ear with a short elongation from the front of the ear.The skin is dissociated from the underlying tissue and the platelet is pulled under the jaw line.The back edge of the muscle is actuated, then lifted up, and the muscle is fastened behind the ear with multiple stitches on the bone.By pulling the back edge of the muscle upwards, the front and sides of the neck are tightened effectively.Afterwards, incision is carefully closed with thin stitches. For Platysmaplasty, an incision is made beneath the jaw and the edges of the two sides of the muscle are joined together like a corset and a sharp new neck line is created.Inevitably, high level of skin loosening occurs after Platysmaplasty, which requires an incision in the back of the ear to further lift and tighten the neckline. If such an incision is not desired and the problem is not unbounded, Spider Net aesthetics and Fat Transfer can also be used. What is the level of marks that remain after neck extension? How is recovery after neck extension? During the first few days after the neck extension, patients need to adjust their head slightly upwards at a 30-degree angle to reduce the swelling.Any pain or discomfort can be controlled by low dose painkillers.Patients are examined one or two days after surgery for bandage and medical dressing change.Swelling and bruises will disappear within ten days after surgery. When can I return to work after the application of neck extension? Most patients start working within 1 week after neck extension. When can I exercise after neck extension? Aerobic activity is not recommended during the first 2 weeks after neck extension.You can start upon the approval of your doctor within 1 month after the application.